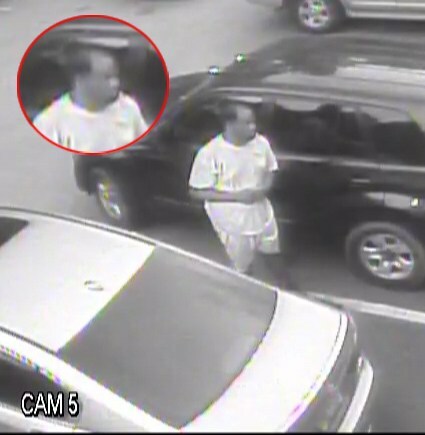 Berkeley County deputies released surveillance photos to identify a suspect in a vehicle break-in at a Huger church | Crime Stoppers of the Lowcountry: 554-1111 | 1-888-CRIME-SC | Anonymous tips earn cash rewards with Crime Stoppers of the Lowcountry. Berkeley County deputies released surveillance photos to identify a suspect in a vehicle break-in at a Huger church. Deputies investigated a report of a vehicle break-in at the Charity Church on Cainhoy Road at approximately 8 p.m. Monday, according to Berkeley County Chief Deputy Mike Cochran. Church members said while they were attending services, someone broke out a rear passenger window and stole approximately $350 worth of items from the victim's vehicle. The burglar, believed to be between 35 and 45 years of age, was wearing a light-colored shirt and shorts appeared to be driving a dark-colored full-size SUV believed to be a 1999 to 2000 GMC Yukon or Cadillac Escalade, Cochran said. Anyone who can identify either of the people in the images is asked to call the Berkeley County Sheriff's Office at (843) 719-4412 or Crime Stoppers at (888) 274-6372.